What business licenses to open a new restaurant? The hospitality industry is highly regulated by various state and local authorities often requiring complex and detailed licensing. Government agencies subject businesses in this industry to rigorous inspections and enforcement of the law due to public health and safety concerns. Businesses in the restaurant industry may require a variety of licenses from basic business licenses and tax registrations, to industry specific licenses. Additionally, each license may be issued by the federal, state, county or local government. Below are a few industry licenses triggered by certain business activities. Most jurisdictions require a food service establishment permit to open a restaurant. Owners and managers are generally required to obtain food handling permits, which often require the completion of a mandatory food handling and sanitation training. These permits ensure that the restaurant meets regulations regarding food sanitation, storage, protection and preparation. A building license is required for any restaurant in order to verify the location’s operational safety. This can include clearly marked and working fire extinguishers, fire escapes and emergency exits as well as obtaining an occupancy license, often issued by the local fire commissioner. Depending on location, the restaurant may also be required to obtain a tax permit, sign permit, alarm or zoning permit and other building permits. Liquor licensing can vary dramatically from jurisdiction to jurisdiction. State authorities require restaurants to obtain an alcoholic beverage or liquor license if the establishment intends on serving alcohol. Many city or county governments also have liquor license requirements. In fact, they may even cap the number of licenses available in a neighborhood or on a block, making it impossible for a new restaurant to obtain a license. If a restaurant intends on playing music, live or recorded, a license must be obtained from a music licensing organization in order to be compliant with federal laws. The nation’s three most prominent clearing houses include BMI, ASCAP and SESAC. These organizations are music performing rights organizations, representing songwriters, composers and music publishers. Obtaining licenses from all three can eliminate worries over expensive penalties. In addition, restaurants that allow dancing may be required to apply for an additional license, often called a cabaret license. Restaurant businesses operating without appropriate permits or with an expired permit are subject to both state and local penalties. Penalties range from high fines, cease and desist orders and even criminal penalties, such as jail time and probation. With such severe penalties, it is crucial that restaurant businesses obtain and maintain the appropriate licenses. 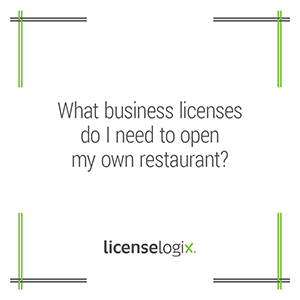 The licensing experts at LicenseLogix will manage the process of obtaining your restaurant business licenses. LicenseLogix can help you obtain all the licenses and registrations you need, as well as perform business license research, and manage your ongoing license renewals. For additional help you can click contact us, or give us a call at (800) 292-0909.